Lately everyone has been talking about the “Let’s torture Darcy” club, and I admit I am a proud member. But despite being a member of this club, I have always been more of a “Let’s torture Elizabeth” kind of girl. 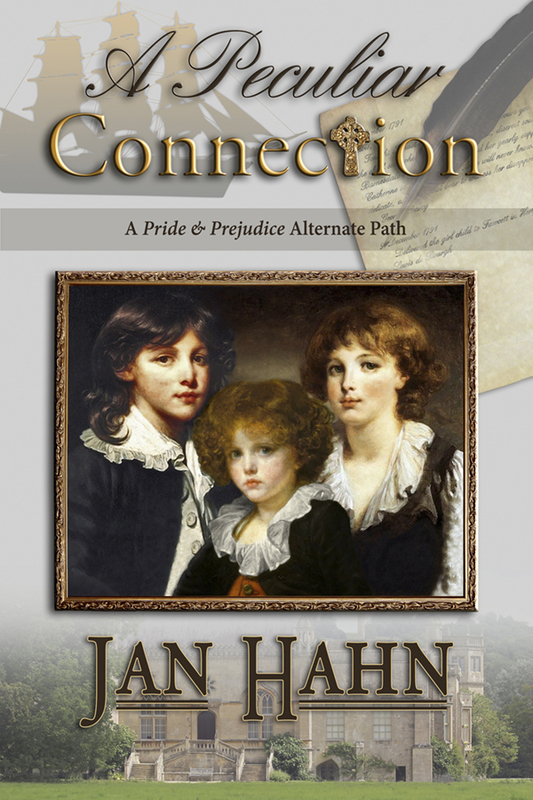 Jan Han has created a premise that is perfect for me because in A Peculiar Connection she pretty much tortures both Darcy and Elizabeth in the most wonderful manner! What if in her visit to Elizabeth, Lady Catherine were to reveal the most torturous information? What if she told Elizabeth that she was the illegitimate daughter of late Mr. Darcy, and therefore sister to Mr. Fitzwilliam Darcy? How would they react to this information? Would they try to establish a relationship as siblings? Would they prefer to never see each other again? Would they give up on their love? And could fate be so harsh on them? This premise takes us into a long adventurous journey leaded by Darcy’s hope and persistence. Even though the book is written under Elizabeth’s point of view, it is Darcy’s love and character that makes us travel through England and Ireland in search of happiness. I loved the way Darcy never gave up on his love for Elizabeth. He was just as I imagined him to be under such circumstances: supportive, constant, brooding, passionate and relentless. “I am… no one. I am just Elizabeth, and I do not know where I belong or to whom”. I fought the bleakness welling up within me, but I could not hide my sorrow from him. Mr. Darcy rose to sit beside me, taking both my hands in his. I turned my face away, but he commanded me to look at him. “You belong to me, Elizabeth”. This is just one of those scenes I absolutely adored. But the great thing about this book is that it is filled with great moments, so many that it was hard to choose the ones I would mention on the review. In fact, the story is so interesting, the scenes so intense and Darcy’s character so well developed that when I finished reading the book, I just wished Jan Han had also written the Darcy POV of A Peculiar Connection. I would love to read the scene after Elizabeth leaves Pemberley in a rush under Mr. Darcy’s point of view, or to know how his encounter with Lady Catherine was, or his reaction when discovering the documents in his aunt’s house. And I most certainly wanted to read how he felt when discovering the identity of Elizabeth’s father. “Expressionless, the light had vanished from his eyes as surely as if one had doused a candle”. Wow! What a premise, what a story! I loved your review, Rita, and loved the book. There must be hundreds of perfect phrases, but the first one that springs to my mind right now is ‘What I need, dear girl, is for someone… anyone, to tell me that your father is not my father’. That, and the ever so charged scene when they danced together, and he asked her if she could ever dance in silence, and then they did. Amazing story! So many intense scenes in this book!! I actually stayed up until 3:00 am on a work night to finish it the night it wa a published!! Oh, Rita, thank you so much for your review of A Peculiar Connection! You are more than generous with your kind comments. I’d love to write this book from Darcy’s viewpoint, but I just don’t have the nerve to tackle it again. I think your imagination will fill in the blanks just fine! I had this on my wishlist and this review has made me more eager than ever to read it. It now tops my list as the premise is so heartbreaking and I’m really interested in seeing how things are resolved by the end. I also like to see our favorites tortured. Very strange, isn’t it? But I do! I’m currently reading this book. Is everything as you descrive.It was a relieve to read that you “like” to see Elisabeth tortured, because one the things I like is that in this variation the suffering his not made 80% by Darcy. I feel a litle bit more normal.